A contemporary dance course aimed at exploring intention in movement. Even our subconscious intentions can expand or destroy us. By bringing intention and attention to our movement patterns and tendencies we can manifest powerful changes within! Through various modern dance techniques and a full class from floor to choreography, we will bring awareness to our actions and direct our energy constructively. Learn to consciously guide your movement while increasing technique, strength and flexibility in the body. When energy is released with intent, it has the power to create change. Come change with us! TIMES: Tuesdays - 20.00 - 21.30: This class is taught in english! LEVEL: This course is open to dancers of all levels. At this time of year we could all use a little help relaxing our frozen joints and rigid shoulders. In these cold and dark days who would not like a back rub and some coziness? Hands on! is a two-hour monthly session in which we share a number of softening, loosening and mobilizing bodywork methods done with a partner. Instructors Jojo Hammer, Vera Köppern and Edegar Starke will guide participants through exercises drawn from the methods of Reiki, Somatic Work, Axis Syllabus, Katsugen, Butoh, etc.. Partners will take turns giving and receiving, so that by the end of the session we have all learned new techniques as well as accepted a relaxing treatment. Join us in taking time to do something kind for each other and ourselves! Hands on! take place in a friendly and inviting atmosphere and are open to everyone, no previous experience needed. The sessions are for you and about your well-being, please wear comfortable, warm clothing. Come alone or with a friend! In this workshop, we will explore the rhythms and impulses that provoke us to move, to speak, and to sing. We will deepen our understanding of the internal/external rhythms’ influence on us, as well as how they orient us in space, situations, actions and stillness. The aim of the workshop is to provide tools to develop a brief scenic vocal proposal of performatic vocation which will be presented at the end of the workshop. Open to all lovers of the performing arts. You do not need any previous singing experience to take part in the workshop. Bring at least 5 songs learned by heart, bring instruments or pots to make noise or music, bring a personal playlist that moves you to dance, to move, or brings about clear emotions in you. Bring comfortable clothes and costumes of your choosing. Rocio Guzmán is a singer and performer from a family of Andalusian musicians. Her study of classical texts in her training as a Graduate in Philosophy, along with the artistic family influence in the arts of flamenco and traditional Andalusian song, initiated her first contact with contemporary dance and physical theatre. This led her to study performance and singing at the PanthéÂtre and Roy Hart Centre in Paris. Upon her return to spain, she worked as a director in several of her own stage creations, studied Sephardic music, Arabic and Flamenco influences, and began exploring Latin American Roots, Jazz, Free Improvisation, video creation and composition of stage music for dance. This training and experience led her to take part in international voice projects, as well as groups in the field of Contemporary dance and music. In the last ten years she has begun her solo career with musical and scenic research projects. During the research Attila has found that once you are in a repetitive process it creates a powerful state of self-determination- something that needs to be questioned and challenged. What is this power? One’s own power that is inner power/energy source. Where does it come from? Where is in my body? Do we have a spiritual body? We hope to answer these questions with further research. In this workshop you can learn and explore the way that Attila works, you will be given an insight into the current research work and share your own ideas and findings from the tasks that you will be given. 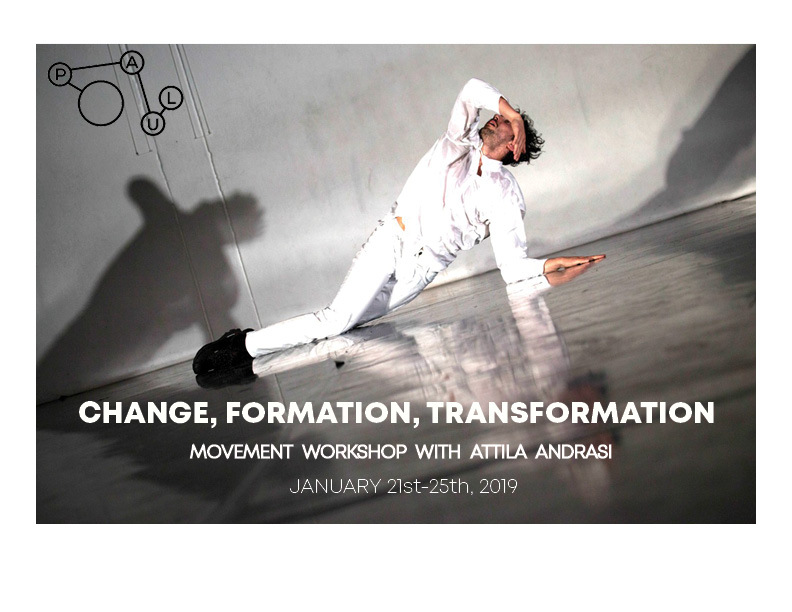 This will be an improvisational driven workshop where Attila will let the crowds unfold and see different, individual feedback and experiences. This is a guided hour where you will work in your own space with guidance and instruction from Attila, who is specifically looking for movers who can investigate what repetition is and how far you can take your bodies and find out what your limits are. This workshop offers practical movement research tools to performance artists of various movement backgrounds. The tasks and information that will be provided requires a high level of physicality and curiosity. Candidates should have adequate experience with contemporary dance. He was born in Hungary where his interest in dance started at the Budapest Contemporary Dance Academy. He gained his first experience in performing at Trafo and Mu Theatre in Budapest where he danced the role of the boys in Öröglakat by Sandor Petrovics. Attila continued his studies at the Salzburg Experimental Academy of Dance (SEAD) where he gained professional experience at different festivals. (New Face Dance Festival in Salzburg, Symphonic Dance Festival, Tanz House Festival and To Spring Tanz Festival in Salzburg) During this time he worked with Alleyene dance company (UK), Eduardo Torroja (ESP), Jelka MIllic (SL), Elton Petri (GR), Rakes Sukes (IND) after he finished his study He was collaborating with Lior Lazarof (ISR) HZT Academy, Berlin with Anna Németh (HU) and The Ryder Project Gallery in London with Andrea Canepa (CO). Currently he is living and working in London where he is kiing the opportunity to develop his own company which just started. In this workshop, we will work towards a performative state where the dancer can embrace the nebulousness of the ever-changing present. We will begin by coming together with a group warm up, then move through a range of exercises, from simple movement tasks to free improvised scores. We will gradually build ourselves into a state that is both meditative and alive, where we can feel empowered in our choice-making while giving in to the unpredictable. The workshop will incorporate tools for a personal improvisation practice, movement generation tools that Francesca and Erika use in their collaborative practice, and ideas specific to the work they are currently creating 'DUST' (which will be performed at PAUL). The basis of this workshop are the accumulated working methods and material of the past 20 years of Juan Carlos Lérida’s artistic work. Juan Carlos Lérida shares his techniques and approaches of themes and of scenic work as well as concrete material. Accompanied by Juan Carlos, participants are invited to copy, to remix and to transform in order to find their own movement qualities, sequences and choreographic handwriting. We explore body and improvisation techniques using flamenco as a starting point for unique, rhythmical, and dynamic ways of moving. The results of the workshop will be shared with the audience in a final showing. The workshop addresses dancers of all disciplines. Juan Carlos specific approach facilitates an amplification of their proper range of movement qualities, independent of the participants’ previous experience with flamenco. Juan Carlos Lérida is one of the forerunners of Contemporary Flamenco, an important innovative force, who constantly questions flamenco, breaks it open, and develops it further. With his creative and teaching technique, the Flamenco Empirico Method, Juan Carlos investigates flamenco, its formal language, dynamic and rhythm and makes it tangible for the audience and dancers. His unique way of working is reflected in the works of flamenco artists such as Olga Pericet, Belen Maya, Marco Flores or Marco Vargas & Chloé Brûlé, for whom he works as a choreographer and director. He grew up studying classical flamenco and expanded his education by studying contemporary dance, physical theater, and improvisation. He founded and curated the contemporary flamenco festival “flamenco empirico” in Barcelona. He has been teaching flamenco, contemporary dance and composition at the Institut del Teatre Barcelona since 2002, and gives workshops on technique, composition and improvisation in flamenco worldwide. In 2017 the documentary “Corps Flamenco” (F) was dedicated to the Flamenco Empirico Method. *IN THE WEEK OF JULY 9TH-13TH, WE ARE HOSTING 3 WORKSHOPS WITH JUAN CARLOS LÉRIDA & SAMUEL LETELLIER. JOIN US FOR ONE, TWO OR ALL THREE WORKSHOPS! The Feldenkrais Method is a technique of self-awareness through movement. We introduce a series of subtle movements that deepen the understanding of our own body’s habits. It is a method to gradually refine self-awareness, understand our body’s organisation and find ways of moving more efficiently, with less tension and greater depth. This work is addressed to people that are interested in deepening and amplifying their range of movement. It invites artistic and personal growth, wellbeing, and offers relief to those who suffer from stress, backaches or neck pain, and chronic pain. We are going to have a close look at the organisation of movement in the shoulder girdle and the arms and explore how they articulate with the torso and the thoracic crest. Through this work, we will achieve greater ease in the shoulders, by focusing on the relation between arms, thoracic crest and spine, we will free the cervical zone and the diaphragm. We will explore the flexibility of the pelvis, its supportive role in the body. We will work with subtle exercises addressing the pelvic floor. In the investigation of the hips, we will explore their role in the transmission of strength from the floor to spine and into the head. We will observe the head-to-pelvis connection in order to find flexibility in the thoracic crest. These workshops can be taken separately. However, ideally they are taken together for a holistic experience. A full week of workshops focused on body & dance by guest artists Juan Carlos Lerida and Samuel Letellier. Samuel worked as a professional dancer, choreographer and dance teacher for professional dancers, children and people with disabilities in numerous dance companies throughout Europe. He settled in Barcelona and dedicated himself entirely to the study of The Feldenkrais Method. Certified by Feldenkrais Federation International, he now shares and teaches this method in weekly classes and workshops throughout Europe as well as guest teaching at the Institut del Teatre, Barcelona. Party means collective celebration, the primacy of the public over the private. institutions must be discredited in order to sanctify the collective order. SANCTIFY THE PARTIES is a workshop approaching the concepts of tradition and festivity from a contemporary perspective.Impurity, remix and audiovisual narrative will be recurrent concepts, along with onstage audiovisual codes concerning the body. We will also address different ways of approaching folklore as an act of rebellion (post-folklore) and of participating in a collective celebration of electronic party. The concept of purity in different artistic spheres such as flamenco will be discussed. The objective is to reach the State of Partying, a state able to free our body and pull us away from fear. The work "State of Partying" written by the sociologist Enrique Gil Calvo is a cornerstone of our methodology, especially in his conception of party as a public, collective and liberating entity, which coincides with our lines of research. Several excerpts from his work will be analysed and discussed. The last day will consist of a public showing on stage drawing on the tools gained through the process of the workshop. In this workshop we will delve into musicality through body and footwork while exploring the concepts of space-time-sound. One focus of the course is technique in order to 'tune our instrument', another point of focus is improvisation. We play with music of different disciplines and use silence as a point of departure. This workshop is open to all levels! An introduction to the concept of the body as a musical instrument in space, for performance artists and dancers of all disciplines. This two day course (2 sessions of 2 hours), will delve into rhythms and movement qualities within the moving body with a focus on grounding and exploring movement dynamics through tension and release. By approaching the exceptional movement qualities underlying flamenco, we will use flamenco dance as a gateway to deeper grounding and investigating new dynamics of the body in space and time. As we investigate the idea of the dancer as a musician and the deep musicality intrinsic in flamenco, participants will be encouraged to connect on a deeper level with the rhythm and pulse of their bodies, sitting into it in a grounded and connected way as opposed to sailing above it. Dancers and Performers of all disciplines are encouraged to attend this workshop to explore new movement vocabularies and musicalities for their practice. Noemí Luz is a multidisciplinary artist who works with flamenco, contemporary dance and visual arts. She trained classically at Elmhurst Ballet School and Central School of Ballet and also has an HNC Diploma in Fine Art. Noemí relocated to Seville in 2007 where she specialized in traditional flamenco and bata de cola under the tutelage of her mentor Yolanda Heredia. She has performed in venues such as Tablao Arenal, Casa de la Guitarra, Peña la Perla de Cadiz and Centro Andaluz de Arte Contemporáneo. She has also collaborated with Yolanda Heredia on bata de cola masterclasses in Seville. In 2014 Noemí formed part of an artistic residency in Florida run by choreographer Niurca Márquez. She also co-founded award-winning dotdotdot dance company along with Magdalena Mannion and Yinka Esi Graves. They most recently performed in Sadler’s Wells ‘Sampled’ festival in February 2017 and are currently developing a triple bill of work titled ‘In Body’. Noemí premiered her solo work ‘The Ugly Truth’, a collaboration with sound designer José Tomé in London at the Cervantes Theatre in 2017 and has also performed the work at Coetani Festival of Experimental Flamenco in Athens. She is currently working on a new project called ‘Silver Thread’ which addresses the fragile nature of memory and the issues faced by those affected by dementia. This is a collaboration with spoken word artist Toni Stuart and sound designer José Tomé. Juan Carlos Lerida is considered one of the forerunners of contemporary flamenco. He explores the flamenco artistically and didactically, freeing him from stereotypes and opening up space for a personal, unique access to flamenco. With his highly acclaimed play 'Al Baile', the final work of his trilogy 'Al Toque' - 'Al Cante' - 'Al Baile', he is currently touring worldwide as a dancer, choreographer and lecturer. Having grown up with classical flamenco, he expanded his education by studying contemporary dance, physical theater and improvisation. He founded and curated the contemporary flamenco festival 'flamenco empirico' in Barcelona and further solidified his successful working and teaching method of the same name. With this workshop, Juan Carlos Lerida offers an introduction to his unique approach to flamenco - a must for all those who want to expand their flamenco and explore a different side! Juan Carlos Leridas 'Flamenco Empirico Method' teaches a liberated, lustful and unconstrained approach to flamenco and creativity in flamenco. As a sensitive and experienced teacher, he teaches a guaranteed new way of working in flamenco technology and provides the tools to live his own ideas, concepts and competences in and through the flamenco. Juan Carlos shows his students the way to discover their own artistic expression in flamenco and to discover, explore, expand ones own 'universo flamenco'. The workshop is aimed at dance enthusiasts of every level (from beginners to professionals!). Juan Carlos' specific approach allows all participants to expand their own flamenco horizons regardless of their previous dance experience. If you have any questions, do not hesitate to contact us! This two day workshop is designed for dancers and movers of all disciplines. Together we will explore the dialogue between the dancer and the music . With backgrounds in both music and dance, we’ve developed a workshop format that allows participants to explore their connection and approaches to music instantaneously with both pre-produced music and live improvised music. Jojo and Vera come from both contemporary dance and contemporary flamenco backgrounds, offering a wide perspective on the body’s interaction with music as well as an approach to flamenco’s sharp and rhythmical movement vocabulary. We will examine the music’s various layers and dynamics as we search for our independence and power within music and sound. The body’s capabilities as an instrument will be explored as we play along, with, against, and parallel to the musical instruments. Together, we will examine how we can position ourselves with the music, creating stark juxtapositions or melding the two disciplines into one. We will approach composing duets and trios with the music as a partner, explore the rhythmic body, and examine the difference between a rhythm or beat coming from the outside that would propose, or even dictate, a certain metrical system to move to, and our own, endogenous rhythms. This workshop will delve into our own archaic understanding of how our bodies can live (within) rhythm. Juan Carlos Lerida is regarded as one of the forerunners of Contemporary Flamenco movement. He explores flamenco artistically and didactically, freeing him from stereotypes and opening up space for a personal, unique access to flamenco. His unique way of working is reflected in the works of flamenco artists such as Olga Pericet, Belen Maya, Marco Flores or Marco Vargas & Chloé Brûlé, for whom he works as a choreographer and director. He grew up studying classical flamenco and expanded his education by studying contemporary dance, physical theater, and improvisation. He founded and curated the contemporary flamenco festival “flamenco empirico” in Barcelona and developed a successful method of working and teaching under the same name. He has been teaching flamenco, contemporary dance and composition at the Institut del Teatre Barcelona since 2002, and gives workshops on technique, composition and improvisation in flamenco worldwide. In this workshop, Juan Carlos Lerida introduces his unique approach to flamenco dance - a must for all who want to expand their training and explore a different side of the technique! Juan Carlos Leridas 'flamenco empirico method' teaches a liberated, lustful, and unconstrained approach to flamenco and your own creativity in flamenco. As a sensitive and experienced teacher, he provides a guaranteed novel approach to flamenco technique, as well as the tools to express ones own concepts and competences in and through flamenco. Juan Carlos teaches his students how to reach personal artistic expression within flamenco and to discover, explore, and expand ones own “universo flamenco”. This workshop deals specifically with improvisation and site specific composition. We use the resources of flamenco as tools for creation and open and expand the possibilities of flamenco aesthetics and shape. We perceive the space as an effect, the music as our support, and bring our flamenco to a specific place, a kitchen, a dressing room, a courtyard entrance. We let the dance of the room influence and develop it through new impulses. The course takes place in the rooms of PAUL studios Berlin; These rooms are available daily for the rehearsals and research for 2 hours before the workshop. When singing, the body is an instrument, radiating power, expression, and agility through the voice. Often, however, the intense focus on the voice seems to slow down our otherwise self-evident handling with the body. While singing the arms become strange appendages, which somehow want to be moved. So how can we remain present in our bodies while simultaneously maintaining concentration on the voice? In this workshop, we are looking at ways to translate the power, intention, speed and color of the voice into movement, presence, expression and permeability of the body. We are searching for the ways in which the voice and body not only work in parallel, but work, express, and flow together. To synchronize body and voice we will work on a somatic level at the perception of the body at the muscular level, as well as the bones, joints, and tendons. We will listen to the body, observe and support its natural response to vocal movement. Finally we will work on an interpretative level with physical expression, playfulness, seriousness, changeability, trace vocal and verbal images with gestures, in a manner that supports the vocal flow. Vera's focus is on the performative and expressive potential of organic movement, of alert, agile, and conscious bodies. We, Vera Köppern and Elisabeth Keuck, invite you to a workshop from March 4th-6th 2016! This workshop is aimed at those who wish to expand and deepen their flamenco vocabulary. Throughout our workshop, we will be exploring a vivid, authentic and penetrating interpretation of classical flamenco choreographies, and introducing a work of contemporary flamenco. We approach movement with ease and seek access to what moves us in dance. We discover the ground as an ally, the balance as a source of strength, and we strengthen our own body perception. We observe our muscles, our skeleton and small details in the body and their great effects on movements and postures - both internally and externally. We consider basic elements such as our breathing, the floor, the space, the group, the music and objects for the dance and place them in new relationships with ourselves. We examine the flamenco rhythm as well as the form of flamenco movements and sounds and place them in an organic context with ourselves. This course is the first of a series of workshops on flamenco in contemporary contemplation, with a particular focus on the elements of physicality, improvisation and composition. From May 20th to June 12th, Citlali Huezo Sanchez will open a LABORATORY where we examine scenic design through body and movement! In doing so, we explore the fundamental principles of the body as a presence on the stage such as centering, attention, directions, tension-relaxation and impulse-counter-impulses. We consider the body as an active presence that shapes time and space. We examine the phase before the word or movement, the silence and the immobility to discover impulses and the need for word and movement. In four 'laboratory units', we will work on the design of a common and personal gestural vocabulary: we examine the quality of movement, create movement splits, translate word, object, concept, image into movement language. With the use of new and existing tools, scene - solos, duets or group scenes are created. The lab will culminate in a joint work showing. PAUL would like to give everyone the opportunity to move, regardless of their financial situation. Therefore, we are launching a brand new Income-Based price system for our classes! There are three different price brackets based on your income. The first price applies if your income is less than 700 Euros per month, the middle price applies if your income is less than 1000 Euros per month, and the last price applies if your income is more than 1000 Euros per month. Choose which price applies to you based on your income and then choose between our three different payment methods; Drop-In, 10 Class Card, or a Monthly payment with a contract. This system is flexible and based on trust. You may change your price bracket whenever necessary and there is no need for proof of your finances. Please keep in mind that in order to offer these lower prices, we need a percentage of our students to pay at least our standard (middle) prices to balance out our costs.